Ancient Dr. Lao (Tony Randall) and his circus of supernatural attractions arrive in the small town of Abalone, New Mexico, and proceed to change the lives of the townspeople. 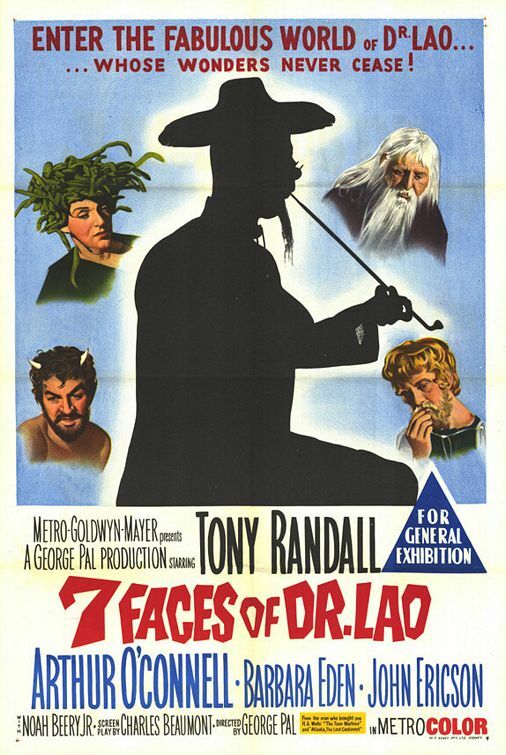 As Peary writes, Tony Randall’s brilliant performance in 7 Faces of Dr. Lao “may be the finest [ever] in a fantasy film.” Randall rivals Peter Sellers (who was originally considered for this film) and Alec Guinness in his ability to seamlessly embody multiple characters in one story. Indeed, thanks in large part to Randall’s acting chops, Dr. Lao and his attractions — snake-headed Medusa, the ancient magician Merlin, the blind seer Apollonius, a ribald Pan, the hairy Abominable Snowman (in just a bit part), and an animated serpent — are thoroughly distinct entities; though kudos clearly belongs to those in charge of make-up and costumes as well. Unfortunately, the plot suffers whenever Randall is off the screen, and I suspect this may be the answer to Peary’s puzzlement over why the film hasn’t garnered more of a cult following over the years. I recently read the novel upon which the film is based (The Circus of Dr. Lao by Charles Finney, originally published in 1935), and discovered that the underlying plot of the movie — about an imminent take-over of the town by greedy investors — was added on by the filmmakers, as was the romance between Barbara Eden’s single mother (simply a young, virginal teacher in the book) and John Ericson’s newspaper editor. Indeed, Finney’s unusual novel is ultimately more of a philosophical musing than a plot-driven story, and must have been somewhat difficult to translate to the screen. Nonetheless, Dr. Lao is lots of fun once you get beyond the first twenty minutes or so — and it is certainly must-see (if not repeat) viewing for any film fanatic. Yes. Tony Randall’s multiple performances are a wonder to behold. In complete agreement re: Randall’s performance(s), but not a must. a) For the most part, it’s a film for children – a group I would hesitate to call ‘film fanatics’. For kids, though, it’s fine and recommended. b) Though released in theaters, it’s hard thinking of it as a ‘film’; most of it is photographed, directed and acted (often broadly) like a ’60s tv show. c) Rather than “beyond the first twenty minutes or so”, the “fun” kicks in around 40 min.+: the first evening of Dr. Lao’s circus show. Up to that point, it’s a s-l-o-w climb as the plot unfolds. Director Pal has generally not paced his film well — a number of scenes are a little longer than they need to be (the Pan sequence, in particular, seems to go on forever). The best sequence, oddly, does not include special effects: the scene in which the vain townswoman has her fortune told by Apollonius; she’s receiving her comeuppance in a way, yet Randall’s cool delivery – with a touch of sorrow – allows us to see her as a tragic figure. I agree that “Dr. Lao” is flawed and too slow in many spots, but still think Randall’s performance makes it “must see” for film fanatics at least once. I’m reminded of a recent disappointment — “The Devil Wears Prada” — which is insufferable whenever Meryl Streep isn’t on the screen, but may be worth watching simply for her. Indeed, I think there would be an audience for an edited “version” of “Prada” with just her scenes… And perhaps the same goes for “Dr. Lao” as well. When it comes down to whether a certain element (at least) of a film makes it a must, subjectivity enters. The way I look at it: If one element (i.e., a performance) is worthy of note, but the rest of the film has too much working against it, I’d note the worthiness of that element but otherwise suggest “You’re on your own.” For me, if that one element is very strong and in a watchable, if not overly memorable, film – i.e, if the film’s competence level is adequate overall – I’ll label it a must. In this case, though, I find the first half a sludge to get through – a real drawback. I’d certainly recommend it for kids (there are some nice life lessons for them), but I wonder if even that audience (considering what kids today demand of movies) would have the patience for it…as opposed to something like ‘Fantasia’, made 20+ years earlier and – for kids and adults – holds up relatively well in modern times.